This is a Protected Denomination of Origin (PDO) certified extra virgin olive oil from the hills around the area of Vasto in the province of Chieti in Abruzzo. 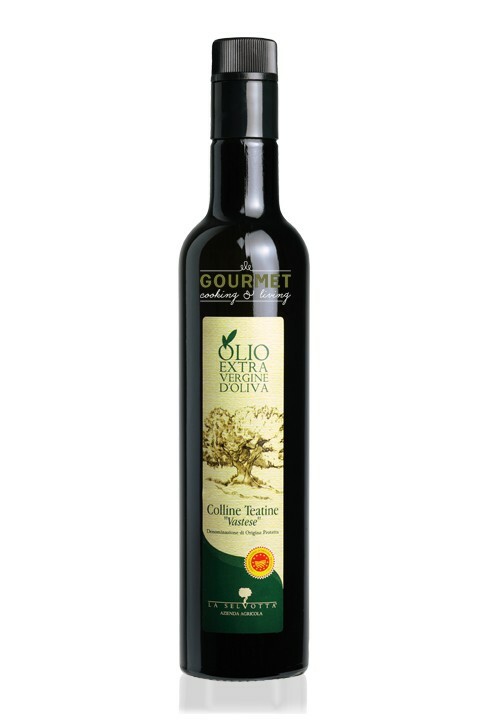 It's a very well balanced olive oil made with a bland of three different kinds of olives. To the nose it expresses elegant notes of freshly cut grass and olives. Its herbaceous taste presents clear notes of almond, with spiciness, bitterness and freshness in perfect equilibrium. Excellent on rice salad, steamed seafood, legume soups, grilled meats, fresh cheeses, etc. Buy 2 for $18.99 each and save 6% . Buy 3 for $17.99 each and save 11% .